Oil-covered bird lies dead on a polluted beach in Santa Barbara, Calif., shortly after the 1969 oil spill. Fifty years ago and five miles off the coast of Santa Barbara, Calif., an oil well blew, cracking the sea floor and sending 3 million gallons of crude oil into the water. The oil coated 35 miles of coastline and was so thick on the water it muted the sound of waves. But the largest oil spill in the nation at the time also amplified drilling concerns and helped trigger the modern environmental movement, quickly leading to the National Environmental Policy Act of 1970 and, a few months later, the formation of the Environmental Protection Agency. The Clean Air Act, Clean Water Act, Coastal Zone Management Act, and Endangered Species Act followed. So did the first Earth Day. Half a century after the Jan. 28, 1969, spill, California environmental groups and politicians find themselves struggling with the effects of climate change and fighting Trump administration rollbacks to those protections. They are also in another oil fight: The Bureau of Ocean Energy Management plans to offer oil and gas leases along nearly the entire U.S. coast. A draft environmental impact statement on the plan was due in January, but delayed by the government shutdown. The state has also acted. Then-Gov. Jerry Brown (D) signed two bills last year that banned new leases or permissions to build new oil- and gas-related infrastructure on state tidal and submerged lands if related to federal leases on the Outer Continental Shelf. 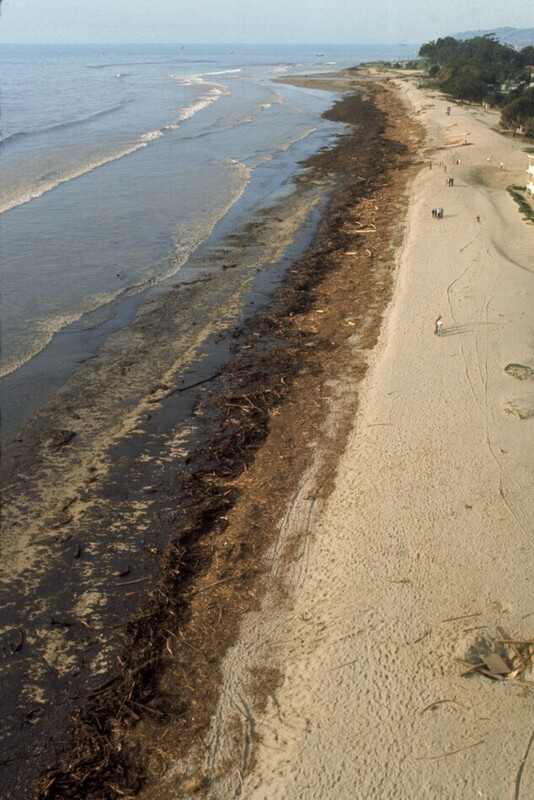 An aerial view of Hobson Beach in 1969 highlighting the damage from the oil spill in Santa Barbara, Calif.
Western States Petroleum Association President Catherine Reheis-Boyd said the spill’s 50th anniversary should encourage people to remember the impetus it provided for environmental protection. Jackson, who represents Santa Barbara, was a college student when the 1969 oil spill hit. The oil flowed until Feb. 7 and killed 15,000 seabirds. Dolphins, seals, and sea lions were also poisoned. In response, the California Coastal Commission was created, as was an environmental studies program at University of California, Santa Barbara. The State Lands Commission also banned offshore drilling, a rule that lasted 16 years. Federal authorities also admitted they had given the company, Union Oil, a waiver so they did not have to entirely encase the pipe as normally required by regulations to prevent blowouts. The “acceptance of responsibility was the start of a long chain of federal concessions admitting that it was at fault to some degree,” according to a paper from the University of California at Santa Barbara. Oil and gas regulations were strengthened. And they were again when the Exxon Valdez spilled 11 million gallons of crude oil in Alaska 30 years ago this March. The Oil Pollution Act of 1990 gave EPA more authority to prevent and respond to oil spills. But that hasn’t ended spills. The 2010 Deepwater Horizon spill in the Gulf of Mexico released 100 million gallons. And in 2015, Santa Barbara’s environment was again harmed when an oil pipe burst releasing 142,000 gallons of oil just before Memorial Day vacationers were about to arrive. Environmentalists say it’s another example of why offshore oil and gas drilling has to stop and the focus switched from fossil fuels to solar, wind, and other energy sources. “We need to commit to weaning off oil and developing renewable energy, which isn’t lethal to the planet,” Jackson said. Sierra Club California Director Kathryn Phillips agreed. A year after the 1969 spill, the University of California, Santa Barbara’s environmental studies program issued a Declaration of Environmental Rights, mostly aimed at conservation. On the anniversary, that declaration will be updated, said David Pellow, a professor of environmental studies at the school.